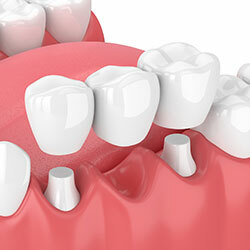 At Integrative Dental Care, we recommended a crown when there is not enough existing tooth structure to support a more conservative restoration (like a bonded filling) to achieve a healthier bite, or for cosmetics. A crown fits over your tooth like a glove fits on your hand: essentially strengthening your tooth by providing full-coverage support. There are several different types of crowns. Our doctors will discuss all options that will be best suited for each person’s particular situation. An excellent crown will help save a tooth for many years of protection, aesthetics, and function. A bridge replaces missing teeth with artificial teeth, looks great, and literally bridges the gap where one or more teeth may have been. 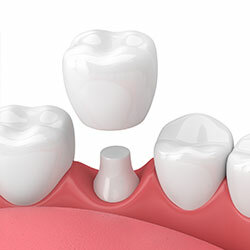 Similar to a single crown, the teeth on either side of the space are prepared to support a full coverage protective crown, which is also attached to the tooth that fills the space. Your bridge can be made from gold, porcelain, or a combination of these materials, and is bonded onto surrounding teeth for support. The success of any bridge depends on its foundation: the other teeth, gums, or bone to which it is attached. Therefore, it’s essential to keep your existing teeth, gums, and jaw healthy and strong.